Nerium’s new product "Memory Formula"
Nerium International Korea, the global premium skin care specialized company, headquartered in Addison, Texas, U.S., announced the launch of "Memory Formula," one of Nerium's health care supplies for those living in today's world — the world of "stay healthier, live longer." 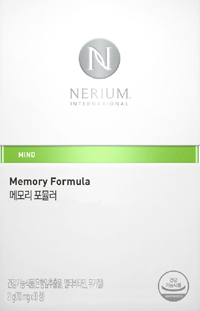 Memory Formula is health functional food that is for your brain health.The Ministry of Food and Drug Safety (MFDS) of South Korea approved Nerium's Memory Formula as a legitimate health functional product for its effectiveness in improving memory and blood circulation. Memory Formula is a health functional product that contains gingko leaf extract and multivitamins (vitamin B6, B12, C, and D), and mineral (selenium) as its main ingredients, and EHT coffee bean extract as a sub ingredient. Take 1 tablet each day and you will feel more refreshed and invigorated for its possible influence in memory performance. Produced by Nutri Biotech (an original design manufacturer specialized in health functional foods), one of the affiliates of Cosmax, the world -famous cosmetics manufacturer, Memory Formula is now available via official brand partnership of Nerium International Korea. Nerium International is connection marketing company, headquartered in Addison, Texas, U.S., which provide products made of differentiated ingredient and technology. After the establishment on August 2011, it has reached new record in revenue and has created about a million of fan. It has received attention in the industry. Nerium, which is operated by professional management, provides quality of products based on dermatology. Also, under the mission of ‘Making people better’, Nerium has concentrated on developing skincare products which could improve customers’ life. For more information about Nerium, visit www.nerium.com. The Significance of "First Statement"